There is nothing more exciting and unexpected that will bring a smile to ones face than random mail. It seems odd that mail in the age of e-mail, twitter, Facetime, Google+ Hangout's and whose its and whats it galore (oddly enough the random cycle of my iTunes library had those lyrics playing as I was typing this. Another unexpected smile). Mail is awesome. Last week when I was on vacation in the Outer Banks (cut short due to some stupid hurricane or something like that, I mailed post cards to some people. Just for chips and pringles. Some people got #complexcrabs, others got other random stuff. All in all though it was awesome. When I came home, I had a few things sitting in my mailbox. 1.) Bills, eew. 2.) Birthday card from my friends the Haskell's with a DD Gift Card in it. 3.) Birthday card from C , I laughed it was great. 4.) A small package from Jess and Josh. 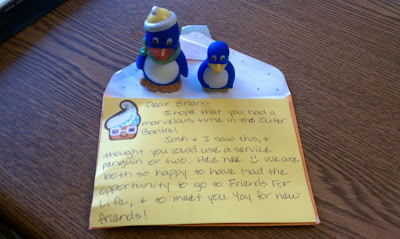 In it were a card and some penguins. That is all. But if you look there is an awesome cupcake winking at me, telling me to eat it. A nice letter, there is more on the other side, but well you don't get to read all of my mail, weirdo's. And the "Service Penguins". While they are tiny, they are awesome. They don't leave much of a mess, they can tolerate my air conditioning, feeding them is a charm. I just hate trying to put their shoes on. I just can't get that training down. Anytime I try, it is all flapping arms and pecking. Apparently their training is a little rough still. However, they can make me smile and remind me to make sure my sugar is right so it is awesome. I love mail. Thank you Jess and Josh. Chatting with people makes me smile. Either the random conversations on twitter, the possible disruptions I cause in the #dsma chats, and "Hanging Out". Awesome. The other thing that can make me smile at times are the random diabetes bloopers we have. While I know there are more out there, this blooper occurred on Tuesday. I was at Target shopping and while waiting in line to check out Beepy McBeeperson started going off in my pocket. I pull him out, sure thing I was 47. Sigh. So along with soap, shampoo, Diet Pepsi, and a DVD, I added Reese's Pieces to the list. I wander out of the store and pour a bunch into my hand, like 1/2 the package. A Yellow Jacket lands on my hand on my Pieces. (Did I mention I for some reason am terrified of Yellow Jackets?) So what do I do? Well like any, wise, civilized person. I throw the Reese's into the air, scream, and run away flailing. I BLAME THE LOW! This post made me laugh in so many different places, I don't even know where to start - and "just for chips and pringles" is now going to be added to my regular rotation of vocabulary. lol! i agree with kim, "just for chips and pringles" is going in my vocabulary too! I am still waiting for my service chicken!